On a remote island in the Bay of Naples, a young boy roams the shore with only his dog for company. Arturo's mother died in childbirth and his wayward father Wilhelm rarely returns to the island. Left in isolation, he dreams up a world of romantic exploits in which his father sails the seas like the heroes in his favourite stories. When Wilhelm suddenly reappears with his new young wife Nunziata, Arturo's imagined world bursts apart, and he falls in passionate, tormented love. As Wilhelm's behaviour grows increasingly erratic, Arturo must begin to face the reality of his father's life, and of his own feelings. 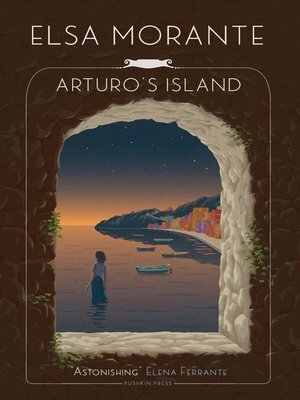 A deeply affecting tale of childhood disenchantment, Arturo's Island is a work of stunning emotional force by one of modern Italian literature's foremost writers. A new translation by Ann Goldstein. Elsa Morante (1912–1985) was an Italian novelist, short-story writer and poet. Born and raised in Rome, she started writing at a young age, initially publishing short stories in children's journals. Her first novel, House of Liars, was published in 1948 and won the Viareggio Prize. She went on to become one of Italy's most lauded writers, winning further prizes and commercial success with her next two novels, Arturo's Island (1957) and History (1974). She died of a heart attack in Rome in 1985.